A fifteen-foot tall military android, Marendex is equipped with two small laser-blasters in his head, two arm-blades, and an Anti-Proton Blast Cannon, which is capable of vaporizing anything in its path. Armed with a Lightning Sword, force-field armor, Electron Gatling-guns, and a short temper. Irk at your own risk. Has all the powers of a garden-variety Vo-Toa (Toa of lightning) plus teleportation and flight. You get three guesses as to why he's here. "Suddenly Rauera bursts into the scenario with a chokutō (Japanese straight sword) and proceeds to jump at it, his blade alit with fire. Astoundingly he manages to split the sphere down the middle and lands safety on the other side of the rock wall, the sphere blowing up above him." Basically, an OVERSIZED sphere of protodermis was shot at the trio but Rauera managed to leap up, split it straight down the middle with only his sword, and landed safely on the other side while it exploded. Stoax also had his moments of luck too. During another attack from SON troopers, Stoax managed to take out an entire wave of soldiers surrounding him with the help of a plasma wave unleashed from his pick axe. Pligurius is also powerful, strategically speaking, in that he manage to successfully lead a raid on Arthaka, though also for reasons yet to be explained. He's pretty strong I guess. Ultrio currently has equal strength as Onua-Mata, and Solus is still trying to learn his powers So Ultrio is the current most powerful, and Solus has the most potential. Wait, is this just mocs or original characters in general? As long as its yours! The only character I have is Oculus, and I like to call him a balanced beast. Oculus is a Toa of Magnetism, so that in itself is very powerful. Although he does have a disadvantage to counter it which I will get to later. Forged in Artakha, OculusNuva's Gold Pakari is one-of-a-kind, being able to give it's user more strength than a traditional Pakari. It also works in the same way as a Rode in the fact that it can be constantly set to a low level, thus making Oculus stronger than most normal Toa. Another special power that was put within the Gold Kanohi is the power to overcharge it for a short amount of time. The drawback to that is it only lasts around 30 seconds at max and will make it's user super weak for a couple of minutes after being overcharged. It will also take anywhere from 10 hours to a day to recharge depending on how long you extended the super strength time. The limitation to his Magnetism powers is that it takes physical strength to use his powers depending on how powerful he wants to make his magnetic fields. Using the Pakari, he can increase his physical strength to use more powerful Magnetism. The overcharge will also make his Magnetism powers incredibly strong, but that immense power intimidates even Oculus to use. So that's pretty much it. If you want to see the weapons he uses, there is a topic for that. I have two characters that are pretty powerful. One is Ailan, a Toa of Air with a whole bunch of powers due to a golden Kanohi. The other is Neuriz, a Su-Matoran who can absorbe energy. This ability is his greatest strength and his greatest weakness: it depends on what energy he runs into, and too much of the wrong kind can kill him. Dambro, the master of Fire and Water. 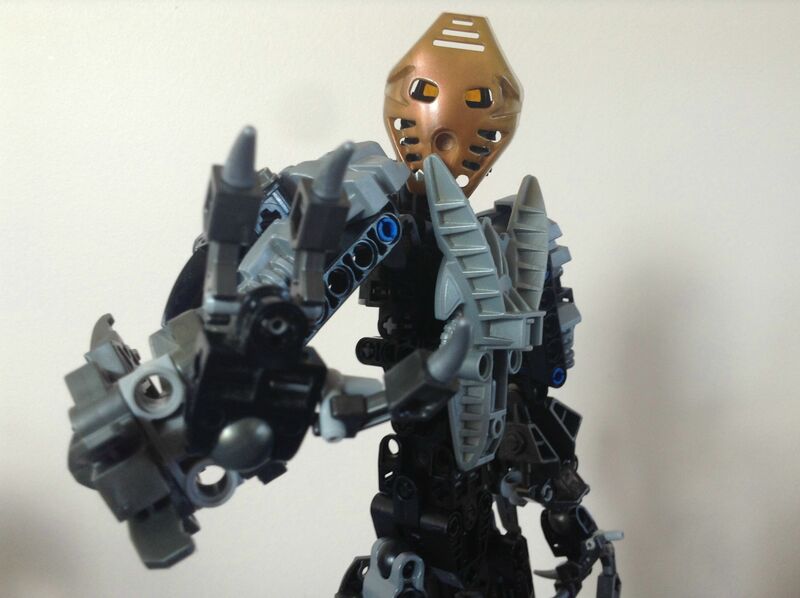 He controls two elements for Mata Nui's sake. Don't get too much more OP than that. Wait, he has a Faxon. The OP has been doubled. Flame sword as well. OP x3(oh baby a triple(1llum1n471 c0nf1rm3d). Able to use his elements to cloak himself. OP x4. That's a hard one seeing as I try to make my characters relatively balanced. I'm going to say Atequ the Illuminated or Arzzanhi the chaos bringer. Both of which are primordial prototype creatures created by the great beings whilst attempting to make an enforcement lifeform to reside in the great spirit. The former was a relative success; being a sort of light elemental with a clear primary operative. Atequ's major flaw is that he is designed with a goal of maintaining peace and order, but his powers ended up being far too destructive to actually accomplish that goal. He would end up leveling cities to protect them. Specifically, atequ can manipulate wavelengths; bending them into whatever form is most effective. As such; he usually creates light, sound, and even lethal gamma rays to subdue enemies. Arzzanhi is a much more primal, and considerably more powerful creature. Whereas Atequ's directive was spot on, Arzzanhi's was warped to the opposite extreme, meaning he has a built in lust for chaos. Fortunately, Arzzanhi's mind is much more primal as well; causing him to act animalistic and even juvenile. He'd rather toy with those around him and interfere with day to day life than shred reality as a whole. As for powers, Arzzanhi manipulates reality on a molecular scale; allowing for him to shred and rearrange physical objects by their very atoms. He could very easily annihilate his foes by triggering nuclear fusion reactions with the metal in their bodies. 1: Main villain of my moc storyline... haven't thought of a name yet. I built him though. His goal is balance between good and evil. He's exceedingly powerful... though I haven't exactly thought of specific powers yet. 2.My self moc: Takua (He isn't actually Takua/Takanuva, it's just the only name he remembers for some reason, so it stuck) Prototype Toa, one of several. He is technically the first functional Toa, and the most powerful, though his powers elude him for a long time. 3: The ancients: a race of bio-mechanical beings that predated Bionicle. Lived side by side with the Great Beings, till they were almost wiped out by the Great Beings. Descendants are the Agori.